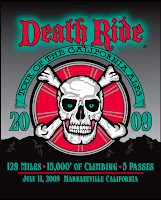 In a fit of madness, I've signed up for the 2009 Tour of the California Alpes, AKA the Death Ride. I've also enlisted biking partners Keith and Bob to join me on this mad quest. The Death Ride is a 129 mile, 15k feet of climbing, monster of a ride. This is as hard, if not harder, than any single Tour de France mountain stage. Total madness. Registration was a disaster. They opened registration at 10am on Dec 11. At 9:45 the registration site Active.com was already returning Java server errors and "too busy" pages. It took 30 minutes of the three of us clicking reload to get though. No Linux browser support apparently. I'm using the Motion Based site to research previous years routes. Good for looking at the ride profile, speed on the climbs and descents. Needless to say, training is going to be tough. I'll need to loose some weight, work on endurance, and most importantly get my climbing legs. I'm looking forward to it.